In my residency training I was very lucky to have a good friend who was a plastic surgery fellow. (Fellowship comes after residency in a doctor’s training, and is very specialized.) My friend taught me various plastic surgery procedures and tricks that I have applied to my foot surgery. When surgeons do hammertoe surgery, part of one of the toe bones is removed in order to straighten out the toe. When the bone is removed, the toe is shortened, which is one of the goals of the procedure in order to reduce the contracture of the hammered toe. When the bone is shortened, the skin length stays the same. As a result of this, there is bunching up of the skin. As an analogy, picture wearing a knitted glove that is too large for your hand. When you push the glove on to touch the tip of your finger, the excess material will be bunched up and folded. Most doctors remove the part of the skin directly under the incision in order to shorten it however, they leave the excess skin on the other three sides of the toe and try to just suture it down, but inevitably, there is excess skin left over that will always be there at the edges of the incision. I’ve heard so many doctors in my training and in practice say that the skin just “reabsorbs”. This is not true, but they just don’t know how to fix this problem. 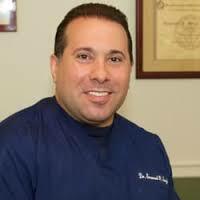 Enter my friend the plastic surgeon… He taught me how to do this complex but tiny procedure called the skin plasty. Through a series of diagonal cuts, triangles, and diamonds, I can reshape the excess skin into a round toe again. This involves using straight incisions at angles to one another that remove the excess skin and create a round toe. I employ these skin plasty procedures in every surgery I do in order to create a more cosmetic outcome while fixing the foot deformity but in hammertoe surgery they are the most important. The first technique is simply incision planning. Where you place in incision is very important and differs from patient to patient. The technique of suturing makes a huge difference in the appearance of scars. Both the skin suturing and the suture closure of deeper layers. Tissue handling techniques makes a big difference in reducing postoperative pain and reducing postoperative swelling. This includes which instruments the doctor uses during the surgery. Bandaging techniques even make a small difference. My friend allowed me to scrub cases with him doing breast augmentations, tummy tucks, face lifts and many other plastic surgery procedures. I think of him every Friday when I perform foot surgery, and am thankful that he taught me how to be a better surgeon. 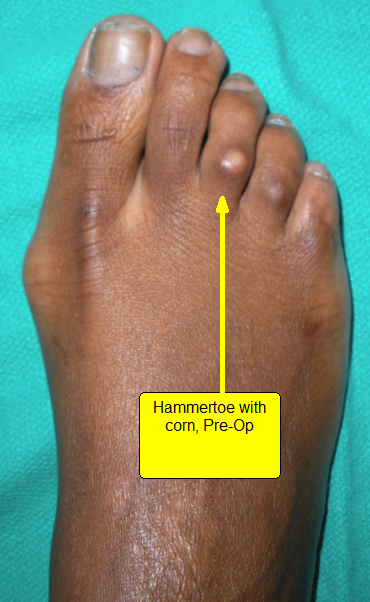 BELOW: Pre-operative photo of foot with third digit hammertoe and corn. 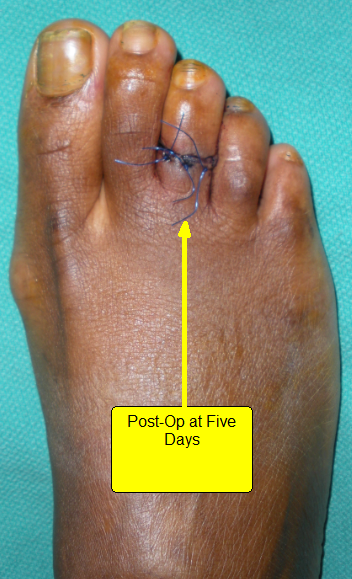 BELOW: Post-operative photo of hammertoe surgery at five days. 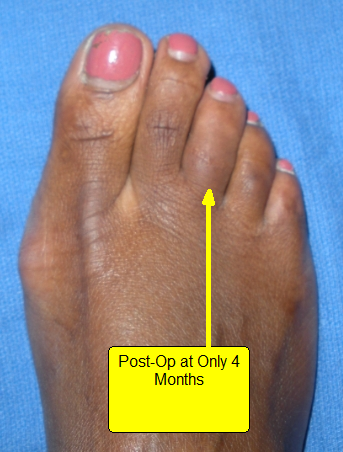 BELOW: Post-operative photo of hammertoe surgery at only four months. hello, I was searching online for recommended podiatrists and your website came up. From the photo above it appears that you did a good job however, with me, it might take alot more elbow grease. I am a single mother who refuses to get a pedicure or anyone else for that matter near my feet. 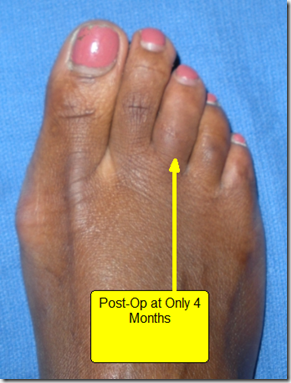 I would like to know your average costs for cosmetic hammertoe correction and toe shortening. What are your payment options for those without insurance? Hi Magdalena. Thanks for the comment here but I would need to see and evaluate you in order to properly quote a price. I have two hammertoes on both feet. The left foot is the most problematic at this point and is causing me a great deal of pain. In addition, my second toe on the left foot has the bone behind the toe longer than the first toe bone is. I think the pain is caused because my second toe is raised completely away from contact with the ground and therefore is not assisting with balance.